Repeated presses of F4 will step back through previous search expressions you have used, as will clicking on the Old button. There is only one list of search expressions, shared between all four searches. Clicking on the Menu icon beside the writable box will open a list of previous search expressions so you can select the term you require. The Case button switches case sensitivity on or off. The Prev and Next buttons cause the Previous or Next occurrence of the search term to be found. It is very often useful to include a space before and/or after a short search word to avoid the word being picked up as part of a longer word. This search is similar to interactive - but is not interactive. List of Found search is on key key F2. As with Interactive Search repeated presses of F2 or the Old button will step back through previous search expressions. You can also press Ctrl-F to list occurences (in the same text) of the word at the caret. Ctrl-Shift-F will list occurences of the word at the caret in all open texts. If not searching for the word at the caret, type in your whole search term and press Return - or click on Go. F2 will cycle through previous expressions. Page Up will cycle through previous expressions. Page Downwill reverse cycle through previous expressions. Ctrl-O will cycle through previous expressions. Ctrl-E Cycle through the 'Engine' choices. Ctrl-S Cycle through the 'Scope' choices. Ctrl-N Count matches without creating a LoF window. Return Start search and allow keyboard navigation of Results list. The Case and start of line only buttons do what you would expect. The Scope opens up a sub-menu with five self-explanatory options, allowing you to search parts of this text or all texts. 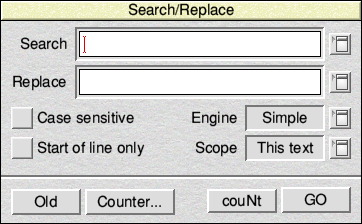 The Engine button allows Advanced Search or Regex Search to be used. This is very versatile (so can get quite complicated) and is described separately. The couNt button does exactly what it says on the tin: counts the number of matches without displaying them. Ctrl-N will perform the same count action while the LoF window is open. The Display button leads to another options window which gives a lot of choices as to how StrongED will display the LoF it finds. 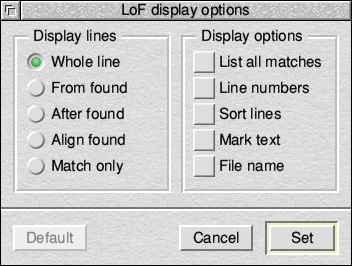 This LoF display window is well worth experimenting with if you use this search regularly. Again repeated Shift-F2 presses or the Old button will cycle through past strings but this is somewhat limited because the strings are not tied together so it is often better to select past strings by using the two menu icons to the right of the writable icons. The Counter button opens a new (untitled> window which is of use in Advanced Replace so is covered there. couNt counts the occurrences which will be replaced without doing the replace. There are several combinations which will invoke a search. These may not work in all modes because Modes can change key bindings. Ctrl-F will do a List of Found using the word at the caret in the current text. Ctrl-Shift-F will do LoF for the word at the caret in all texts. F2 will open the List of Found dialogue box. F4 will open the Interactive Search dialogue box. Shift-F4 opens the Advanced Search dialogue box. Ctrl-N. If the last search was a LoF then this key will find the Next occurrence without opening any LoF window. ESC (or a click outside it) will close the dialogue box. F2 cycles through previous search expressions (same as the Old button). F7 It there is a marked block this key will copy (only the first line of it) to the search box. Ctrl-C toggles Case sensitivity On/Off. Ctrl-E will cycle through Engine options. (not in Interactive search). Ctrl-L toggle Start of line only (not in Interactive search). Ctrl-N will search for the Next occurrence of the last entered search term. Ctrl-O cycle through the Previous search (same as the Old button). Ctrl-P will similarly do a Previous match. Ctrl-S will cycle through the 'Scope' choices (not in Interactive search). Return will start the search. TAB key will switch between search box and replace box. Up arrow key will switch between search box and replace box. Down arrow key will switch between search box and replace box. The List of Found Results window has its own page with more Hot Keys. These are not yet written!